What size ukulele should my kid buy? 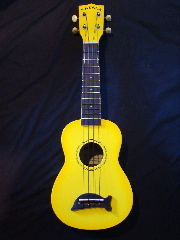 Soprano – this is the smallest size ukulele and is a great starting ukulele size for kids. The Makala Dolphin ukulele I recommend for kids are this size. Concert – this is the next biggest sized ukulele, and the size I prefer to play myself because it offers a bit more space on the fretboard for bigger fingers. Tenor – this is a great size for finger picking, and usually has a deeper sound than the soprano and concert ukuleles. Baritone – the biggest of the lot, and not one I’d buy until your competent playing either of the above sized ukuleles. A point to note is, the soprano, concert and tenor sized ukuleles are all tuned the same way, i.e. GCEA. This is an important consideration when buying a ukulele, as most ukulele sheet music is written with the tuning GCEA in mind. While baritone ukuleles are tuned the same as the top four strings of a guitar. The Makala Dolphin is a soprano sized ukulele and a great place to start for kids and adults alike.